Linlithgow 2s met early for this one o’clock away fixture to accommodate Forrester who wanted the game over so they could support their Ist XV against Portebello. However maybe these early KOs are not a good idea as the Linlithgow 2nds side started much slower than the opposition and the heavy Forrester side were giving the young Linlithgow side something to think about in the scrum as well as the loose. As with all of these games at Forresters if you don’t remove any lurking players from around a ruck they will spoil the game – it’s what they do well! The referee and the Linlithow side struggled to provide a clean platform for Jack Frame standing in at scrum half. Jack was often clobbered by some hefty forward and the ball coming out was not clean and well presented. However the Reds 2s eventually moved down the park as a Forrester player tried to decapitate Stu Young with a high tackle. John Strachan punted the ball to the 5 yard line and, from the ensuing lineout, a penalty was awarded. 3-0 to the Reds with John Strachan converting the penalty kick. Unfortunately the Reds 2s did not collect the ball from the kick-off and one of the Forrester players waltzed through in the centre to score a good try (3-7). Jack Frame, looking sharp at scrum half, took the ball and decided he would score the first of his two tries, converted by John Strachan to make it 10-7 to the Reds. By now, Forrester were getting the better of the Reds in many aspects of the game and came back and scored a second try to take a 14-10 lead. Jack Frame then scored another great solo try, which John Strachan converted, to leave the score at half time 17-14 to the Reds. This score likely flattered the Reds as Jack Frame had scored twice himself from breakdowns and loose play. Unfortunately injuries started to mount for the Reds with Stu Young, Stu Gordon and Calum McKeown all coming off at one time or another. This disrupted the team with changes to position and others playing 80 minutes who had maybe hoped for less game time. Well stuck in by PJ Singleton, Kev Stamp and Finbar Conway who were playing their first games for a while and to big Shug Cochrane who came on and held up the scrum when required. 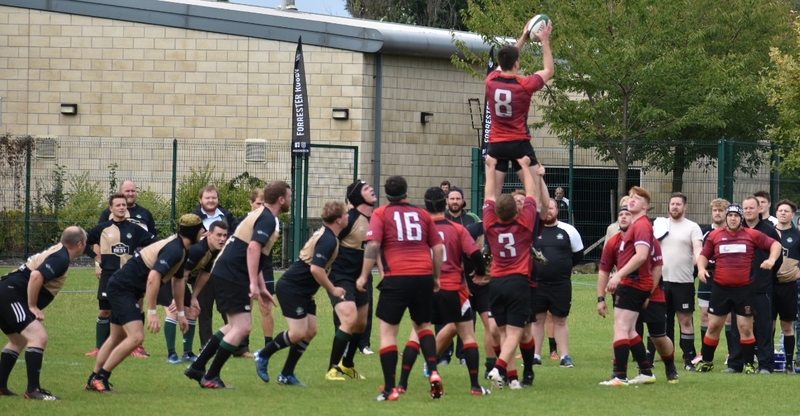 The Forrester team scored three tries in the second half to take their score to 35 and late on Adam Scott added a good score for the Reds from a line out and ruck, which John Strachan converted. However it was too little too late and the Forrester team won 35-24 much to the delight of their baying fans.